SOLD Taxco designer Enrique Ledesma has a fine arts background and it has been said that his jewelry is wearable art. I cannot deny that statement looking at these beautiful cufflinks. Ledesma also worked for William Spratling and Hector Aguilar prior to opening his own workshop in 1950. 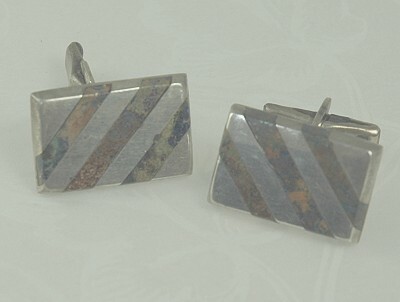 Notice the way the colorful stone merges with the silver, almost as if they are one. His lapidary work is legendary and these links are a fine example. They are fully and correctly marked and numbered with the design/inventory number on the reverse. The eagle mark is the older one that is delineated. According to 925-1000.com, this mark was used between 1948 to ca. 1955. Condition: Excellent vintage. Nice old patina. Measurements: 5/8" long and 1" wide.